If your dog is already upset by being left alone, think about how you can change the picture for her. If she is normally left in a crate, can you leave her in a different way? Perhaps in an ex pen or a gated room? If she is left in one area of the house, can you leave her in a different area? Take time to condition her to enjoy and relax in the new area, just as if she was a baby puppy learning for the first time. Can you avoid leaving your dog alone for a while until you can teach her a different way? Perhaps taking her to a dog daycare or finding a friend or family member to stay with her while you’re gone? Giving your dog a totally different picture and environment can help break the habit of being stressed, but only if you take the time to help her know that it is OK to be alone. Moving her to a different area or situation will prevent her from reacting to any possible associations she’s created with the current confinement space. The more stress you can eliminate from your dog’s life in general will also be helpful. There are several blog posts on this blog about recognizing and lessening stress in your dog’s life. Dogs, like humans, hold their stress cumulatively, which means while they may be able to handle a little stress just fine, the more stress that just piles up and piles up on them eventually creates a breaking point and that’s when their behavior can really go south. There are tools that can help you in conditioning relaxation and low stress separation. Of course, this list of tools is not complete. It is meant to give you some options that you may not have considered before. Not every tool is right for every dog or every situation. Some dogs may not need any of them, and some may be helped by several. Remote treat dispensers – Remote treat dispensers can be set up to reinforce your dog while she is in the confinement area, and can be used to distribute treats when you are not in the area, so can be useful for transitioning to you being gone. Be aware that if your dog gets very excited by food, this may not be the best option, as you won’t be conditioning calm, relaxed behavior if your dog is starting at the machine anticipating a treat all day. These dispensers can be a nice tool to get you started though or to reinforce specific behaviors like being quiet in a crate. Enrichment – Any enrichment activities that you can fit into your dog’s day will help with giving her mental exercise and help her be more likely to be able to relax when you want her to. Some enrichment may be safe to leave with your dog unsupervised to help give her something to do while you’re gone. This will depend upon your own individual dog and finding what works for her. 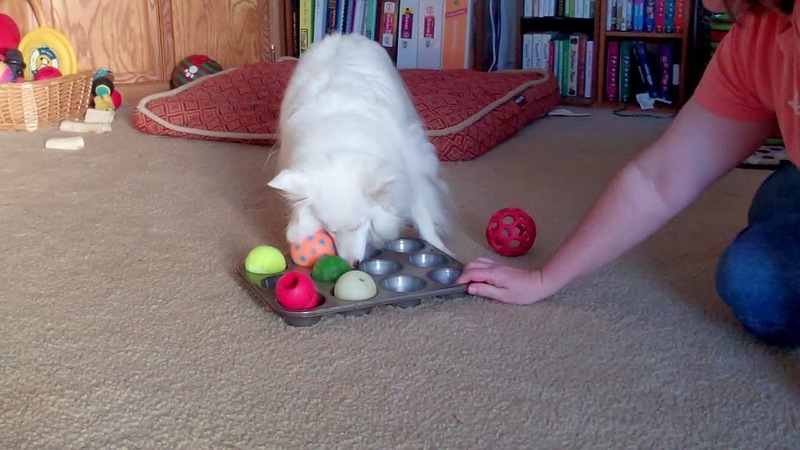 There are many posts on this blog about enrichment toys and games that can be used for any dog, not just blind and deaf ones. Covered crate/ open crate – Some dogs are more comfortable in a covered or airline type crate with solid sides, and some are more comfortable in an open wire crate. Yes, even blind dogs seem to have a preference. Solid sides make for a more cozy feeling and prevent air drafts coming in from all directions which is disturbing to some dogs. Some dogs can relax better in a solid crate because they feel secure knowing there is only one opening, where the wire crate feels open on all sides and can cause them to feel nervous or vulnerable and unable to completely relax. Some dogs are not comfortable at all in crates and prefer a totally different solution. Chew toys – Any toys or bones that you leave with your dog unsupervised need to be very safe, and you need to have watched your dog with them enough to know they will not be biting chunks off and eating them. Chew toys can help by giving your dog something to do and to help them relax. 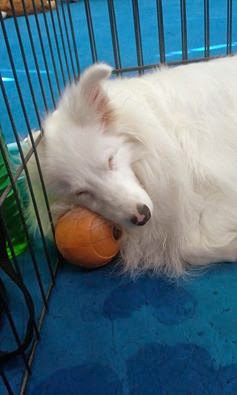 Dogs tend to relax and nap after a good chew. Bodywork – Bodywork can help your dog learn how to relax, and you can use it with your dog while she is in her confinement area to help her associate being there with relaxing. Using bodywork at her normal bedtime may also help, as she will associate it with relaxing and then drifting off for a long sleep. Massage, Tellington TTouch, Healing Touch for Animals, or any number of bodywork modalities can be helpful. Some of these can be learned from books and videos, and others can easily be learned by taking classes in your area. Essential oils – Some essential oils like lavender have long been known for their relaxing effects. This is not the only oil that may be helpful – consult an experienced practitioner or veterinarian for more information about this. The best results come from therapeutic grade oils, not ones just made synthetically to smell pretty. A practitioner can help you choose a quality that is appropriate. Diffusing the oils in the room where the dog will be can help, especially if she is conditioned to relax with the oil diffusing before being left alone. Thundershirt, TTouch wrap – These are great tools for increasing your dog’s feelings of well-being and confidence, and in helping a dog learn to relax. But they need to be worn when the dog is being supervised. So, they could be worn if you are practicing separation but you are home and checking on the dog often to make sure she is not tangled or that she is not eating the shirt or wrap! So, if you are doing cycles of leaving and coming back, this could be helpful. 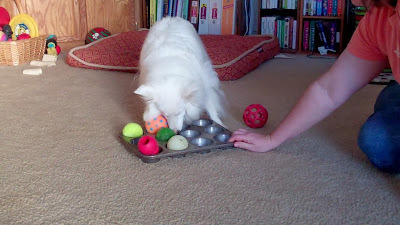 Sniffing and nosework games – I love any type of sniffing or searching games as enrichment. Dogs love to sniff and search. Giving them games like this to play every day, and especially before you leave them alone for the day can put them in a better frame of mind for relaxing and a long nap! Calming music – If your dog can hear, playing calming music can help her to relax, but can also drown out noises from outside which might keep her alert and wondering what’s going on out there. It is best to condition the music during relaxing times when you are home at first. Classical music can work well. Two of my favorites are Through A Dog’s Ear and Healing Touch for Animals CD’s created with relaxation and calming of dogs in mind. Even my deaf dogs respond to the music’s vibrations and will often lie by the CD player on the floor so they can feel the vibrations. They also seem to be able to feel it if the CD player is on top of a solid crate. Be sure to keep any cords out of chewing range and tucked away so the dog can’t pull the CD player down on top of her. DAP collar, spray – Dog appeasing pheromone products can also be very useful. I find the collars (which stay on all the time) or the spray to be most useful. I have not had much luck with the plug ins, but know people who have. If the dog is staying in a crate, I would opt for the spray so the collar won’t get caught on any part of the crate. The spray can be spritzed on the dog’s bedding before you leave or can be sprayed on a cover put over the crate. I hope this has given you some new ideas to try. Put these last several posts together to create a program to help your dog feel more relaxed with staying alone. If you would like help getting started, find a positive reinforcement trainer in your area to work with to help get you started and set up a plan that you can continue to work on. Great tips! Ill have to try these on my dog. Just Let Him Cry It Out?